audience to follow. Embryo doesn't even attempt to make its own premise believable, as if everyone involved gave up before filming even began. 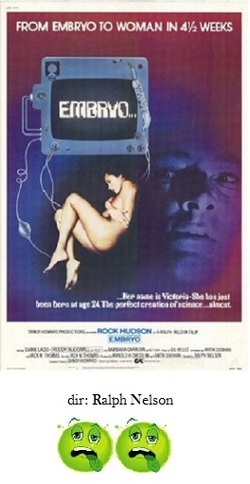 Embryo is an uninspired and lethargic variation on the Frankenstein story that stars Rock Hudson as a brilliant scientist who is trying to find a way to successfully grow a human outside of the womb. First, he is able to grow a Doberman puppy from embryo to full term within just a few days. And once "born" the dog is full grown within a week, but, as you'd expect, the dog isn't quite right. Our first clue is when it kills a yorkie. Unfortunately, instead of being menacing, this scene is unintentionally hilarious as we watch the Doberman shake the tar out of an obvious stuffed animal and then hide it in the bushes. Anyway, somehow Hudson is able to procure a human embryo from a dying woman and grow a human. In about a month, he not only brings it to full term, but the child grows into Barbara Carrera. Not only is Carrera simply ravishing, she's also brilliant, absorbing and memorizing countless books. At a dinner party, she plays chess against Roddy McDowell and he pitches a hissy-fit when she lets him win. So, where is all of this going? Hudson falls in love with Carrera but he can't find a way to stop her aging and Carrera begins to grow unstable after finding out she's doomed and Hudson will ship her off to an institution. Anyway, Carrera tries to steal an unborn baby to figure out a way to save herself from aging, but she dies a withered crone while Hudson does the worst bellowing of "Noooooooooooo!" in film history. and turned to bones before Carrera even entered the picture, and Carrera's aging doesn't come into play until the film's last five minutes when she goes from a 20 year-old to an 80 year-old in record time when it's obvious this whole aging thing should progress throughtout the whole film an not just in the finale. There's also a laughable scene where Carrera encounters a computer so brilliant that it will answer any question typed into it, and she uses this to find out the formula to keep her from aging. Gee, too bad Hudson hadn't known about his handy little device. But since logic isn't a concern here none of it matters much. Embryo might've been fun cheese but the movie is written and performed so drearily. Hudson has scads of voice-over narration all spoken with a dour monotone, and Carrera and the rest of cast plod through the motions as if they were acting at gunpoint. The whole movie is quite a depressing experience.